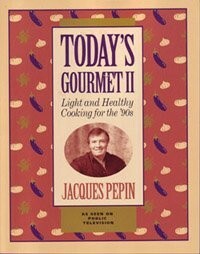 This newest offering from Pepin promotes the light, health-conscious approach to classic cooking that has become his trademark. The delicious dishes range from appetizers to desserts, including Lobster in Artichoke Bottoms; Tuna Steak au Poivre; Chicken in Coriander Sauce; Red Pepper Pasta with Walnuts; Spinach, Ham, and Parmesan Souffle; and more. 16 color photos; line drawings.